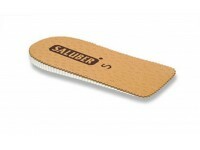 Real leather dual side heel lift , 0.5 cm high. Available in single pieces. INTENDED USE: L..
Real leather dual side heel lift , 1.0 cm high. Available in single pieces. INTENDED USE: L..
Real leather dual side heel lift, 1.5 cm high. Available in single pieces. INTENDED USE: Le..
Real leather dual side heel lift, 2cm high. Available in single pieces. INTENDED USE: Leg l..